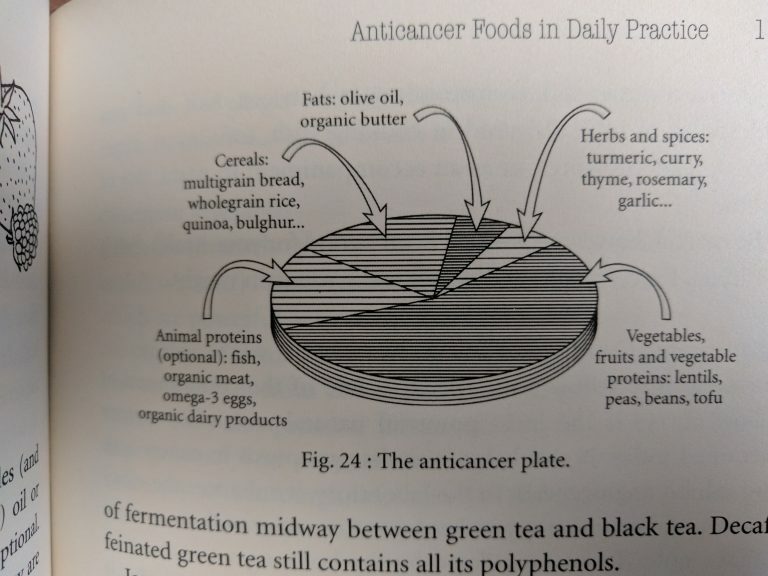 This book has changed the way I look at food. I accidentally came across this book in Blossoms while I was busy picking up some books on business. I had my hands full, so I promised myself that I will pick it up later. In recent years, a lot of my acquaintances and friends have been affected by cancer, so the title intrigued me. I couldn’t shake it off my mind even after I was back at home. So, the following week, I made another trip to Blossoms and (after two-and-half hours of search) picked up the book. 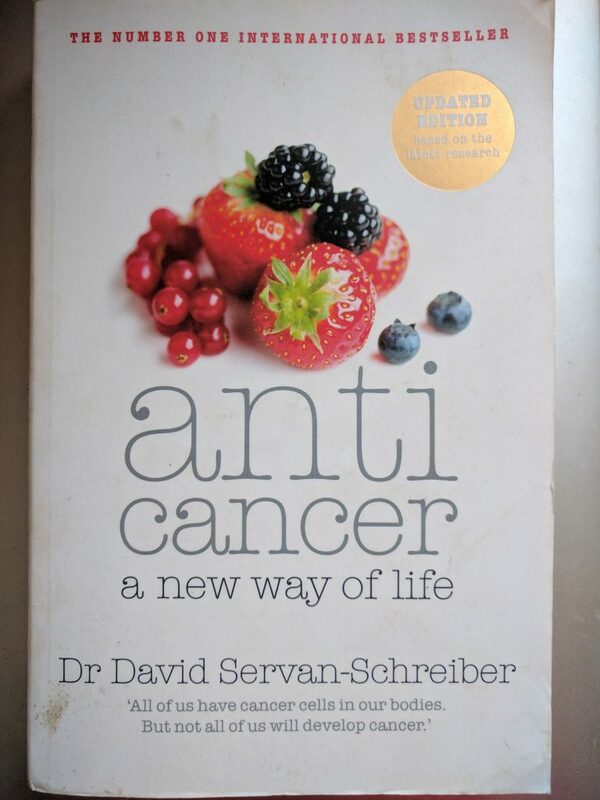 Dr. Servan-Schreiber was himself a cancer patient. He managed to change his lifestyle and food habits and live for 20 years after the diagnosis of his brain cancer. The fact that he was a doctor and understood the human body’s physiology, helped him in rummaging through the umpteen researches that have not seen the acceptance of the market owing to the lack of double blind tests on humans, or, more aptly, the apathy of companies that don’t see a profit from following through. I have discarded the idea that this book is about cancer. As I read through it, I felt that it is as much of a memoir as a guideline to engineering a healthy and happy life. Have foods with low Glycemic Index (GI) and steer clear of the ones that have high GI. Overuse of pesticides may have contaminated the fresh produce and there can be residual contamination. However, choose fresh produce inspite of the contamination if there isn’t any other choice. Have green tea at least 4 to 5 times a day (EGCG). Here is a pie chart that shows the ratio of various foods we should take. A key concept in the entire discourse is treating the body as a terrain. While food is one part of it, exercise and mental well-being is equally important. What am I doing with this information? I have stopped picking up packaged foods without checking its label. The amount of information that can be unearthed just be reading the ingredients on the packets is mind boggling. Here’s an example. Next time you go to pick up some cheese, look closely. It may say cheese on the label but somewhere on the packet, you may find the words processed cheese. It means that only a fraction of that is cheese. As for the rest of it, you wouldn’t want that in your body. Compare that to a packet that says natural cheese. Labels can be deceiving, but more often than not, you’d find a few ingredients that you’ll recognise. I have increased the vegetable and fruit components of my meal. To aid this, I have a spreadsheet that I am using to track my food. The goal is to get as close to the recommendation as possible. I have had discussions on this topic with my friends and colleagues, I have even shared the sheet with them. What I have realised is that one has to understand the underlying principles lest they may be biased to justify their current diet; or worse, try to adapt their current intake of high GI cereals to the above chart and rationalise the decision. It happens. It is difficult to change one’s habits. Then again, difficult and impossible are two different words and are mutually exclusive.